Compact. Light Weight. Smooth and Quiet. Yanmar engines are designed for high performance and maximum engine life. Tested under the most extreme conditions, you can always count on Yanmar engines to deliver the power you need day in and day out, year after year. 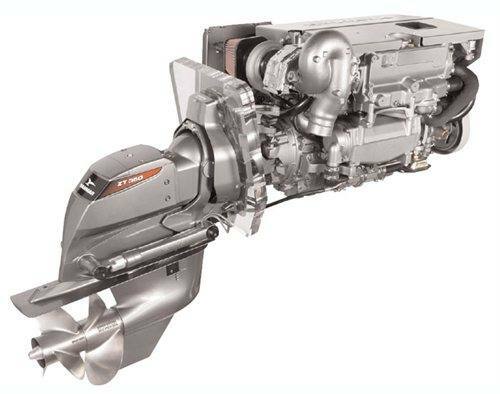 It’s simply the best power package available for new vessels and re-power applications. Convenient Service Points: Makes it easy to perform routine maintenance or handle unexpected repairs. 150A Alternator: Provides maximum power for the cruiser and all electronic needs. 4 Valves Per Cylinder makes for better fuel/air mixture, delivering more power and lower emissions. Cast Aluminum Oil Pan increases durability and provides for improved heat dissipation. CAN Bus Output In NMEA 2000® Protocol: The engine data can be read and displayed by a wide variety of electronic equipment. High quality two part urethane paint protects surfaces from rust. Fully Electronic Control increases efficiency and lowers emissions.